Fine art portraits are the transformation of classical portraits into art. Using creative set design and artistic editing, your portrait will become a work of art. These portraits can be customized to your desired style and taste. Celebrate your family with a timeless custom painted portrait with all the beauty and charm of an classical painting. During a free consultation, you can explore and plan the unique portrait you desire. Karen will then transform your portrait to your desired work of art. 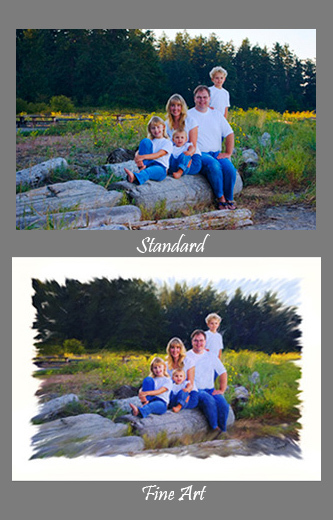 On your approval, the portrait will be printed and framed and personally hung in your home. Karen is a nationally accredited portrait photographer, and a member of the Professional Photographers of Canada (PPOC). Her years of training and experience is surpassed only by her commitment to provide you with the best quality products. Wherever you want your portrait taken at our studio, at your home, or in a selected location, your portrait will be as important to us as it is to you.